Shepherd Staff Super Duty Pole is a heavy duty wrought iron pole. The pole has 4 hanger arms each having a reach of 13". The pole has super strong 5/8" square steel main shaft and 4 detachable arms. This Shepherd Staff pole is a very strong and stable wrought iron pole with its double 12" steps to anchor it. The main shaft has a quick connect socket in the center and 4 sockets to insert the 4 hanger arms around it. 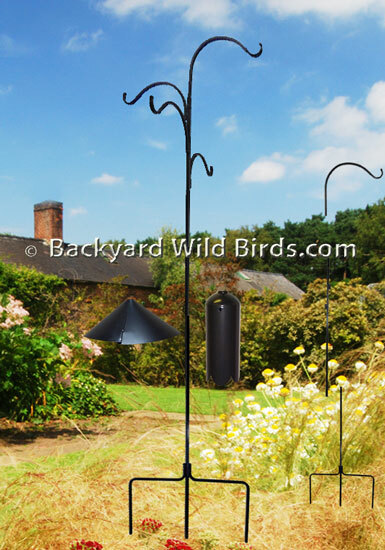 The pole can be used for hanging plants or it can be used as a bird feeder pole by adding one of the optional squirrel baffles. The Cylinder Squirrel Baffle is approx. 17" long and the cone squirrel baffle wrap around is 17" wide. Both stop squirrels from climbing up to the bird feeders that have sunflower seeds or wild bird seed mixes. 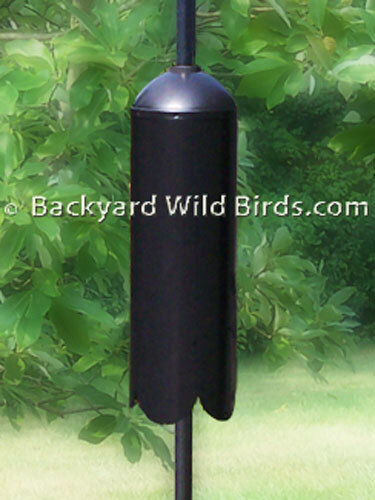 Mount the Squirrel Baffles about 4 ft off the ground (at the top of the baffles) and give your bird feeders a great foundation with a squirrel proof pole! 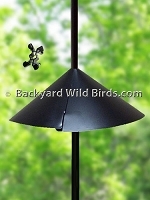 Hang your tall Bird feeders on the top two hangers and short feeders on the bottom two. The pole is made from 5/8" wrought iron and is powder coated with a black semi-gloss finish. The pole has a 93" overall height and is approximately 81" off of the ground with its top hanger arm hanging point at 76". The second arm is at 70", the third is at 64" and the fourth is at 58" above the ground. This Shepherd Staff will hold your heaviest flower baskets and bird feeders.